A colour photograph of the Jabez Lynde House resting at the corner of Cochrane and Dundas Streets. The house stayed in this location overnight before continuing on to its permanent location at the southwest corner of Brock and Burns Streets. View is of the side of the house. The Lynde House was built during the War of 1812 and moved to Cullen Gardens on 2 August 1986. In June 1988, it was opened as a museum and closed in 2005 when Cullen Gardens was sold to the Town of Whitby. In the Spring of 2013 Whitby Council approved the relocation of the Lynde House from Cullen Gardens to the southwest corner of Brock and Burns Streets. It will be used as the new location for the Whitby Historical Museum. 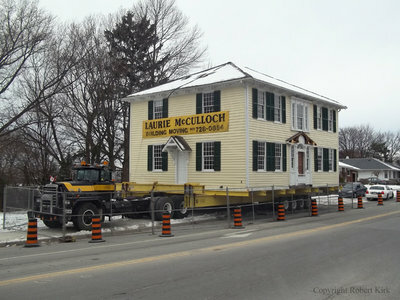 Relocation of the Jabez Lynde House, November 2013, Robert Kirk. Whitby Archives D2013_011_019.